Coming home to a mound of mail after being away for almost 2 weeks is never fun, but when you find a new cookbook in the pile, it can't help but make you smile. What Katie Ate on the Weekend by Australian food blogger Katie Quinn Davis is her second cookbook following What Katie Ate, and focuses on casual weekend entertaining. Filled with gorgeous photos (the first cookbook won the James Beard Award for Photography in 2013) and luscious recipes that won't have you slaving away for hours in the kitchen. It wasn't easy deciding what to make first. I finally went with these healthy fish tacos which were a huge hit at my house. All the components can be made up in advance and then assembled when you're ready to eat. I can't wait to cook my way through this book! Place the fish and 1 T. oil in a glass or ceramic bowl. Add the finely grated zest of one lime and the juice of 2 limes. Season well, cover with plastic wrap and marinate in the fridge for one hour. Meanwhile, place the quinoa in a heavy bottomed saucepan with 1 cup cold water. Bring to a boil, then reduce the heat to low-medium, cover and simmer, stirring occasionally for 30 minutes or until the quinoa is cooked and the water has been absorbed. Set aside to cool. Cook the corn in a saucepan of boiling water for 2-3 minutes, then lift out with tongs, shake off the excess water and place each ear directly on a gas burner or under a broiler on medium heat for 1-2 minutes each, turning often to lightly blacken the kernels. Cool slightly, then stand the ears on one end on a board and using a sharp knife, carefully slice off all the kernels and place in a bowl. Once completely cooled, add the tomatoes, scallion, red onion and chile, then squeeze in the juice of half a lime and set aside to 30 minutes to allow the flavors to develop. Finely chop 1/3 of the mint and cilantro and add to the salsa. Season well and stir to combine, then set aside. Combine the sour cream and the juice from the remaining half a lime in a small bowl and set aside. Roughly chop the remaining herbs (leaving a little for garnish) and place in a bowl. Drain the fish, then toss through the herbs to coat. Heat the remaining oil in a large nonstick skillet over medium high heat. Cook the fish, turning for 1-2 minutes until just cooked and starting to fall apart. 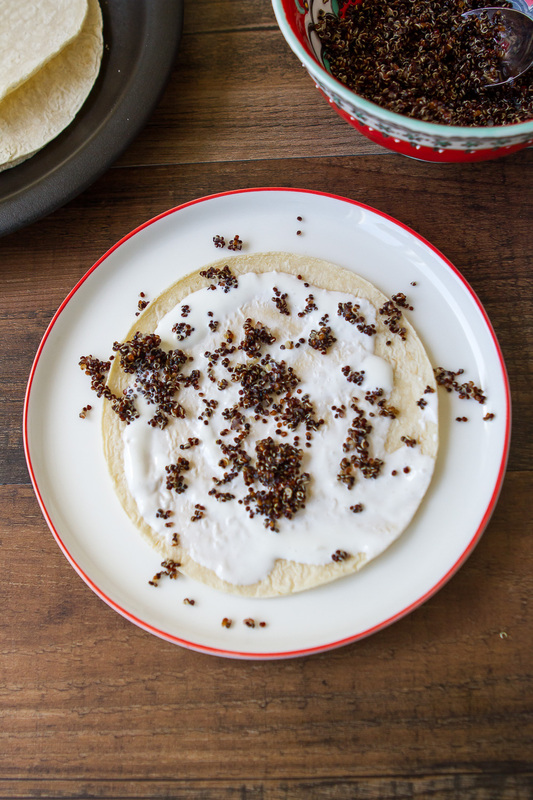 Spread a little lime flavored sour cream over each tortilla, then top with quinoa, salsa, and fish. Garnish with the remaining herbs and serve with lime wedges.